Charles Marion Russell was born in St. Louis, Missouri, on March 19, 1864. His family planned for him to enter the prosperous family business, but even as a youngster Russell’s thoughts and dreams were about the American West. His parents sent him to Burlington Military Academy in New Jersey, but after a year, the school gave up on Russell, and Russell gave up on school. Going west was on Russell’s mind. His parents realized that he would never be satisfied until he went, so for his sixteenth birthday he was given a trip west. In the company of Pike Miller, Russell boarded a Union Pacific train and headed for the Miller Ranch in Montana. Tending sheep was not the kind of life Russell had imagined for himself in the West. However, in the spring of 1881, he signed up with the Judith Ranch, where he stayed for eleven years learning the cowboy’s life. He continued to paint and draw. 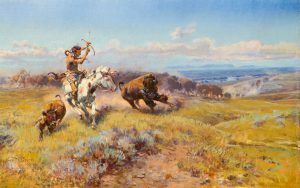 Besides depicting life on the range, he also became enthralled with Indian life. 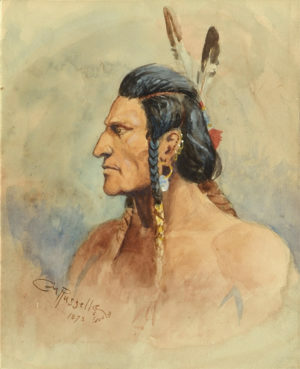 For a while, he lived with the Blood tribe in Canada, a branch of the Blackfoot Nation. There he witnessed the in-depth ceremonies and traditions of a fascinating people. In 1893, Russell moved to Great Falls, Montana. A diverse group of people in these communities became the first collectors of Russell paintings since Russell often gave away his work in payment of bar bills and personal debts. It wasn’t until his marriage in 1896 that Russell became internationally known. Nancy Cooper was much younger than Russell, and she had the determination and drive to make Charles Russell famous. She encouraged him to devote most of his time to painting, and she tirelessly promoted his works through publishers and art galleries. When Charles Russell died in 1926, at the age of 62, he was internationally recognized as the foremost artist of the American West. He had witnessed and recorded, through painting, sculptures, and drawings, a passing way of life.